I was the first to arrive the other morning, a little after 7. Craving my coffee, my warm croissant with butter. Whether it’s Joel, Ann, Andy, Kate, Katie…or a new barista at the counter, I seem to have reached the status of morning ‘regular’ as they tell me what I am about to order, begin warming the croissant, readying the dab of butter, filling a mug of hot coffee while I check to see if my favorite table is empty, set my stuff down and wait for my first hot jolt of java for the day, though I have been up and writing since 5 a.m. If it’s an afternoon coffee fix, I lean occasionally toward a cappuccino, or more likely a late afternoon latte with some sweet, soul satisfying pastry from the aromatic kitchen. Maybe one of Ann’s chewy/crunchy over-the-top oatmeal-raisin cookies. It’s become a habit. My morning meditations/habitations, after forty-plus years in Door, are few but particular: the counter of Al’s, booth #4 at the Viking (Stef, my waitress), or the back corner of the back room at the White Gull. 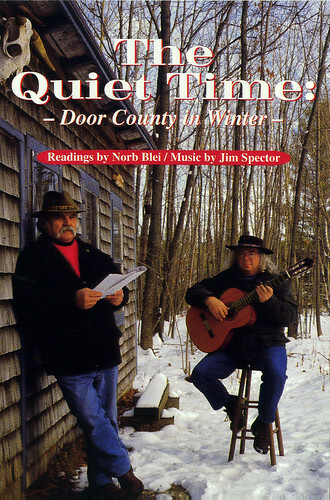 I used to move around the three larger tables at Base Camp (preferring the one on the upper deck near the bookcase with the northern exposure window-view and the stove warming my back in winter), especially those times when meeting with folks over the ‘business’ of books, of writing, of teaching, of art, of local gossip, politics, etc. ), but for months now I find myself comfortably in place at the small, round marble table by the end of the counter (heavy traffic), where I put down my briefcase and newspaper, where the lighting is best to read, make notes, concentrate…or partake of all that is more than coffee at Base Camp: to survey the entire room of coffee drinkers; contemplate the current art exhibit on the walls (presently, the stunning photographs of Dan Anderson); talk with Joel, Ann, Andy, Kate…visit with anybody who has something to say, including Julian (Hagen), who rambles down the stairs often in a mad dash to catch the ferry back home to the Island. Julian of-the-eternal-smile, waving and sending an eye-contact greeting to everyone in sight, hugging BIG hellos to all the women–his special calling card. His presence raising the warmth in the room another notch till eventually (always in haste, one foot out the door) he sidles up to the guy at the small round table…our two/too loud voices immediately gearing up to a frenzy of greetings, stories, memories, future plans—continuing the conversation from wherever we left it last time: yesterday, last month, last year. THIS, then, my morning shot of high octane coffee and socialization these days: solitary old writer getting more solitary and older with each warm cup slowly growing cool in his hand…cool to the touch…cool to his taste…cool, cooler (time passing), till finally cold, the almost bottom of the cup during his hour or more ‘outside’ in the real world, before returning to his other life ‘inside’…to make some meaning of it all in words. 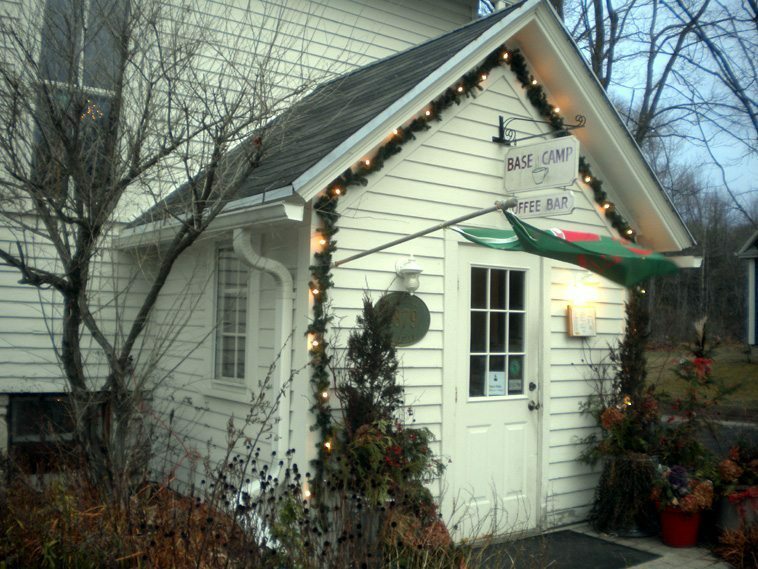 If it’s not the best coffeeshop in Door County, I don’t know what is. I’ve tried them all. Each has a little something to offer but Base Camp has it all. The best coffee. The best pastry. The best croissants, The best luncheon menu. The best soup. The best atmosphere. The best staff. The best prices. The best, most interesting mix of customers. Old, middle aged, young. Locals. Outsiders. Tourists. Everyone’s there or on their way. I’ve never seen anyone asked to leave though he or she may have ordered only one small cup of coffee to nurse through hours of working on a laptop. It’s ‘the’ place to meet in my book. I’ve had great coffee and conversation with locals, neighbors, friends, strangers…visiting writers and artists from all parts of the state, and the country at well. A perfect setting to relax and get things (or absolutely nothing) done. I doubt Joel, who opened Base Camp (downstairs, in the back) to a slow start in May, 2005, (most people couldn’t even find it) had any idea it would grow into what it has become. A very unique Sister Bay/Door County landmark. Joel, who keeps the whole place alive in good food, service, conversation…the maître d’, the Frenchman-in-charge, the king of the kitchen…Joel Kersebet extraordinaire. While his wonderful, hard-working wife, Alicia, runs her superb, successful outdoor clothing shop above, Ecology Sports, Joel lends his personal touch to everything below, exuding a fascinating foreign presence at the counter, in the kitchen, around the tables—the very sound of his authentic French-speaking-American voice something special. There are customers who frequent the place just to listen to his accent. And feel better all day because of it. But there is still another level to Base Camp that Joel and Alicia are either consciously creating, or instinctively feel happening, coming together because of who they are, where they are, what they offer as the setting has slowly but surely become a small, intimate center of ‘county culture’ in its own right, where artists, musicians, and friends meet, mix, gather to share the best of themselves, the best the county has to offer. Case in point: the present sublime photographs by Dan Anderson, gracing the walls of Base Camp. NOT to be missed. Anderson, our own Ansel Adams (with whom he once studied) is the dean of Door County photographers at this point, in a county rich with accomplished young photographers, painters from traditional to abstract persuasion, actors and actresses born to perform on our few but vital stages, poets and writers who know where the stories are, and musicians who can sing the blues, pick the strings of folk with passion, rock the parks—or bring you the breadth of Beethoven on a summer’s night. I call your attention to only two of the nine Anderson photographs featured on the walls of Base Camp. My old friend, Gust Klenke’s garage in winter, in Ellison Bay. The oh-so-blue sky, the branches of the trees flocked with snow, the red sign, the rusty sign, the Christmas wreath on the broken door. The chair where the ghost of old Gust sits himself down a while, whispers his trademark sigh of ‘Yep”…taking in all that’s happened around the old garage since he’s been so long gone. 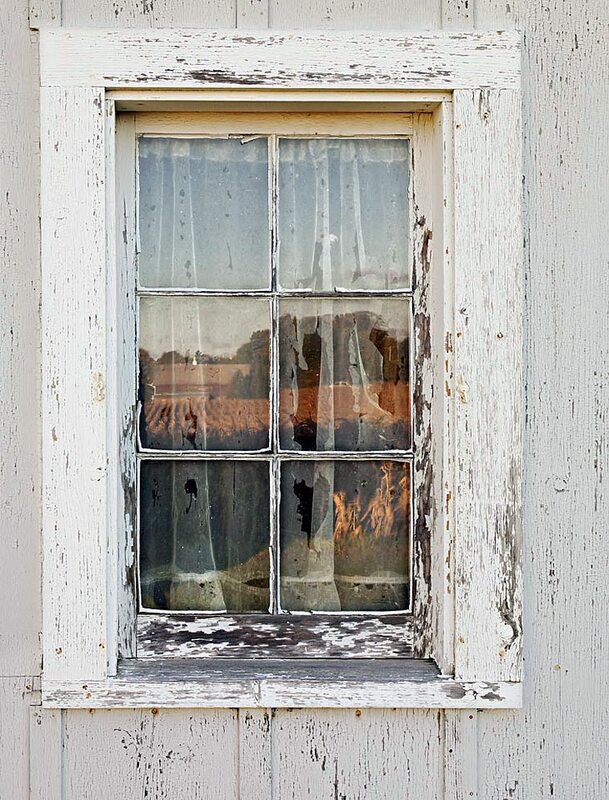 Then there’s that incredible window from a local farm (Barbara’s farm) that Dan has been photographing for years. “Window with Reflections” he calls it. Reflections, indeed. It leads the viewer first to the peeling paint around the old window frame, the sill, all so real you can feel the peeling paint on your fingertips. It’s hard to believe this is a photograph…it’s everything a great painting is and more. It leads your eyes then to the torn white curtains inside…then immediately inside, beyond the glass, where you find yourself “reflecting”…inside looking out? No. Outside looking in AND out…out at the fields in fall. Stillness. Beauty. Silence takes hold…won’t let you go. Finally you shake your head, turn away, carry the image inside you…back to the table. Open your New York Times for a reality check on a chaotic world too visible, filled with words of little or no reflection. You take a long last bottom-of-the-cup swallow of cool-by-now coffee …one final jolt to put you back in place. Back in Base Camp. Joel gesturing, speaking his beautiful French-American to a customer. An old neighbor, Gene Wills, waving hello to me from over there. Julian hurrying down the steps with a smile. Ann asking if I would like a little-warm up of coffee. Yes, I say, yes…glancing back at Anderson’s window over my shoulder, calling me home. Monday morning, having the first cup of coffee in my studio/office/bunker this early icy winter day, wondering who will be the first through the door, wondering how will the clock start. These are places in time, Base Camp, Gus’s chair, Dan Anderson’s window. Google Maps doesn’t have a clue. Now where is my warm croissant? I love that ambience you describe at Base Camp and the “Window with Reflections” is all you say–something you can keep looking at and finding new things. I truly enjoyed reading this. I would love a print of the picture of the window. Does Dan Anderson sell these? Will this article be in a new book or do I have to make a copy to make sure I have it? Of all the writers you choose to be a part of your blog, I like your writing the best. 100% agreement on all you said, Norb. It is one of Northern Door’s small pearls of delight. What a joy to read and experience first hand. All the right words. Perfect. I say Ámen to the comments about Dan Andersons images…….They are the BEST ! Someday I will come there! Someday I will have one cup of coffee no matter what! Then I will wait for it to happen…all the things you describe. I love this that it is part of your day. Part of your joy. Part of the joy of so many others. Norb, great article! Base Camp is my favorite place for coffee and conversation. Myles D mentioned your “blog” (not a very pretty word) yesterday as I was on my way out the Base Camp Door for a quick visit with Miss Ellen in Chicago. Nice words, he said. I concur. Thanks for the good press and the compliments. Norb Blei, Dan Anderson and Base Camp. Lucky us.